Are you tired of wasting money at the salon? Well, you’re in luck, because a quality manicure kit can help you achieve salon-worthy results from home, at only a fraction of the cost. You’ll want to look for a kit that offers professional grade nail tools that will last over time. The right manicure kit will depend on which tools you need, the condition of your nails, and your budget and personal preferences. 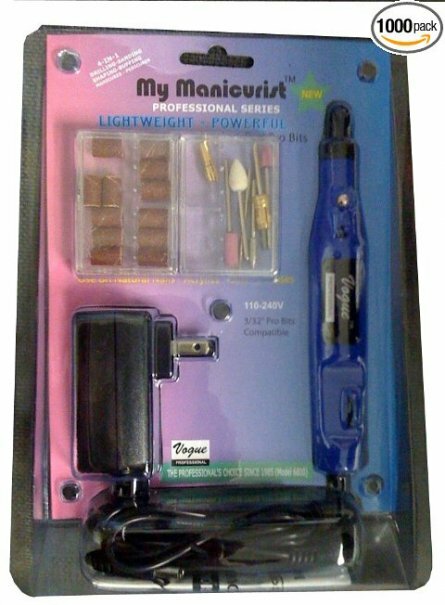 Fortunately, we’ve found some of the best manicure kits available to help get you started. What Is a Manicure Kit? A manicure kit contains everything you need to shape and maintain your nails, trim the cuticles, clear away hang nails and rough spots on your hands, and perfect the skin surrounding your nails. The kit may include nail clippers, nail scissors, emery boards, cuticle nippers or pushers, tweezers, ear scissors, and other nail and beauty tools. With the right manicure set, your hands and feet can always look their best without having to spend extra time or money at the salon. You'll be able to achieve your favorite nail designs from home, on your own time. A manicure kit is the perfect addition to any bathroom, and can serve as a great gift for any man or woman in your life. This high-quality Stainless Steel Manicure Pedicure Ear pick Nail-Clippers Set includes 10 professional manicure essentials, including two nail clippers, cuticle trimmer, tweezers, beauty scissors, nail file, single-edged double-sided push stick, V-shaped push stick, and ear pick. The affordable kit is safely housed in a delicate leather case, making this 10-in-1 manicure set perfect for home use or on-the-go. Available in four colors, you can find the perfect kit for yourself or as a gift. While it is the most affordable option on our list, the set contains high-quality items that have increased cutting force and special polishing technology to ensure you can achieve the perfect manicure every time. As one of Amazon’s best sellers in manicure and pedicure kits, it has outstanding reviews online and is commonly recommended as the best manicure kit for your investment. If you’re tired of having to replace your manicure kit, then the Seki Edge Craftsman 6-piece Grooming Kit is perfect for you. That’s because it's the last set you will ever need to buy, thanks to its unrivaled quality and dependability. 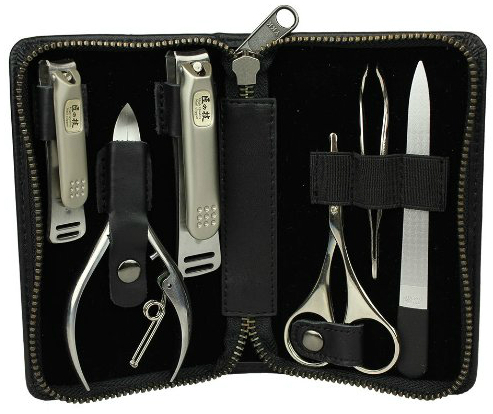 The Seki Edge Craftsman Grooming Kit has everything you need for a manicure, including deluxe stainless steel toenail clippers with nail file, Seki Edge satin straight fingernail clippers, nostril scissors, stainless steel nail nippers, nail file, and the Seki Edge extra grip slant tweezers. Housed in a soft and supple black genuine leather case, you can rest assured that your high-quality grooming tools will be well protected when they aren’t in use. Manufactured by Greenbell, a world-class Japanese manufacturer, you won't need to worry about anything in this kit rusting, breaking, or letting you down. Each item is made with quality materials and workmanship, so it is designed to last for years to come. This complete professional kit is the most expensive option on our list, but reviewers tend to agree that the difference in quality is worth the additional cost. The nail clippers alone are life-changing. Each heavyweight tool has precise cutting edges and a sleek design, so you can achieve the perfect manicure in only a few minutes. In fact, many reviewers noted that you can keep the kit for life or hand it down to your grandchildren. If this set isn’t exactly what you’re looking for, Seki Edge also offers a two-piece grooming kit, a nine-piece grooming kit, and a range of other grooming kits to better suit your personal needs and preferences. Frequently referred to online as “the best manicure kit for men,” this set is backed by outstanding online reviews on Amazon and independent review sites. 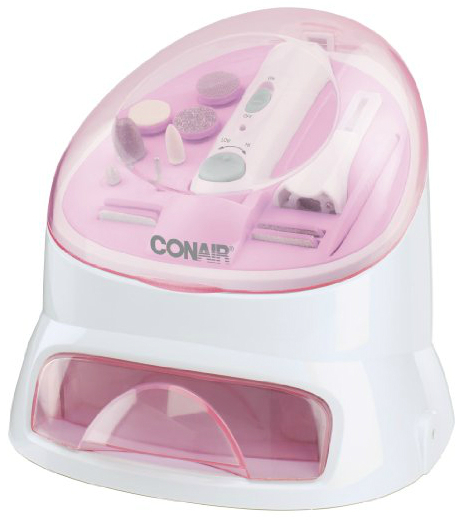 If you’re looking for a complete system that closely resembles what you would find at the salon, then the Conair True Glow All-In-One Nail Care System is right for you. The unique all-in-one design offers professional results from home. This attractive nail care system can help create the perfect manicure and pedicure in just four easy steps. You can quickly shape, smooth, and polish natural or acrylic nails using the 12 attachments, including a cuticle shaper, metal smoothing plate, metal shaping plate, buffing plate, smoothing plate, medium stone cone, large sapphire cone, medium sapphire cone, small sapphire cone, smoothing disc, shaping disc, and buffing disc. The rechargeable nail tool has variable speed control and light to help you achieve flawless results. The manicure bowl will help soften nails and cuticles, while the built-in nail dryer can speed up drying time so your nails look picture-perfect in no time. The bonus travel pouch will allow you to easily transport your nail care system. As one of Amazon’s top rated items in manicure and pedicure kits, this all-in-one system is backed by outstanding reviews online. 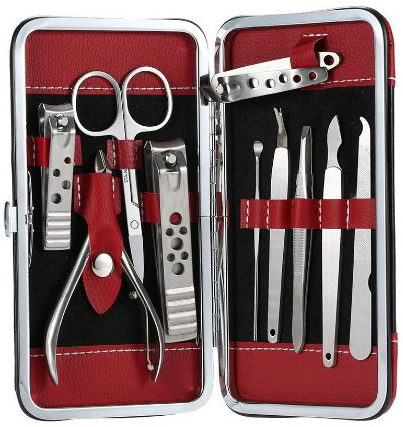 The complete 3 SWORDS GERMANY 8-Piece Manicure & Pedicure Kit includes eight quality manicure and pedicure tools, including nail scissors, cuticle scissors, small nail clippers, large nail clippers, tweezers, hoof stick, sapphire nail file, and a nail pusher. The set is enclosed in a high quality artificial black leather case, so it is perfect for home or travel use. The kit is delivered in an attractive gift box, which makes it the perfect gift or stocking stuffer for any man or woman in your life. 3 Swords Germany also offers an award-winning 10-piece set, 16-piece set, and 18-piece set to best meet your needs and preferences. Made in Germany since 1927, each tool is intricately crafted with superior workmanship and materials. Frequently referred to online as “the best manicure kit for men,” this set is affordable, without sacrificing quality or quantity. As one of Amazon’s top rated items in manicure and pedicure kits, it is sturdy, well made, and provides an incredible value for the money. Whether you have real or acrylic nails, the VOGUE PROFESSIONAL Powerful Plug-in Slim Lightweight Pro Nail Art Drill is right for you. This powerful professional drill is ideal for both home and salon use, and can even be used by beginners. The portable slim drill can be used on acrylics, UV gel, or natural nails. 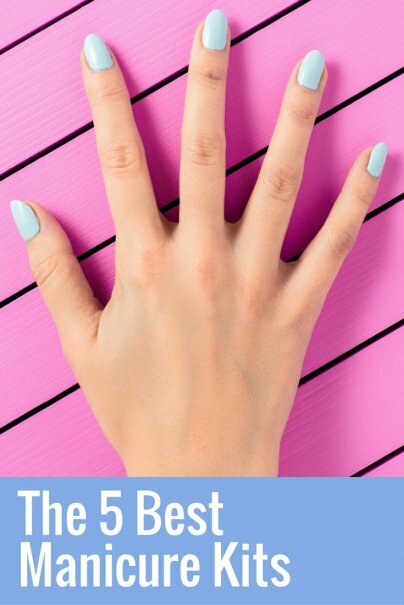 It can file, buff, and shape the nails, remove calluses, insert nail charms, and more. It includes seven specialty bits designed especially for your fingernails. The salon-quality hand drill has a convenient speed adjustment and includes chrome-plated attachments. The switch is on the unit itself, rather than on a foot pedal, which allows for easier, more convenient usage. The exclusive pro attachments can also be easily changed out without tools. While the lightweight drill has been used by many nail techs for nearly 30 years, it is also ideal for keeping your natural and artificial nails perfectly manicured from home. It is easy to use and comes with instructions, so you can master it in no time. This has been a top-selling drill among beauty stores since 1985 and is backed by a 12-month warranty and outstanding online reviews. The company also prides itself on customer service and has a nail technician available to answer any of your questions via email. And those are our recommendations for the best manicure kits. As always, be sure to check Wise Bread's Buying Calendar to learn when and how to buy just about anything!